the papaya factor: On biting off more than one can chew! This entry was posted on 3:07 PM and is filed under Food and diet , My life , Quick recipes . You can follow any responses to this entry through the RSS 2.0 feed. You can leave a response, or trackback from your own site. You have a writer's block, what hope is there for the rest of us. Very impressive attempt, I hope you are continuing on that Drambuie review theme. And, not particularly fond of PB &Banana; maybe I will try a shot of that Drambuie instead. Samir - Not writing in that style. Though maybe I should shift styles hmm, esp. since the current one isnt working at all! Yes, Drambuie is always a better alternative, in fact maybe I should drizzle that instead of honey .... hehe thanks for the idea!! That *gulp* was ur lunch?? 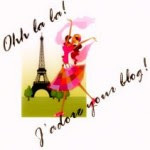 NaNoWriMo!! Hmm I decided against participating in it as I knew I wouldn't spare time to it!!! But all my good luck 2 u dear! Am sure it will come out well!!! BTW M already thru with Fearful! Not saying anything about it as u r waiting to read it na! work is so hectic, eh? Smita - Sometimes (hmm maybe often) I revert to my childhood! I'm not thinking of the NaNo this week, I'm so disgusted with my story *takes deep breath*. So, just tell me did you like it, love it or it was just mediocre - Fearful that is! Bubbles - It's crazy, but more importantly I felt like I wasnt doing anything creative which was another reason for taking part in the NaNo. It's actually worse it's rotting garbage :( Thanks a lot for the wishes anyway!! I probably have already chickened out but if I start writing again I'll need it. 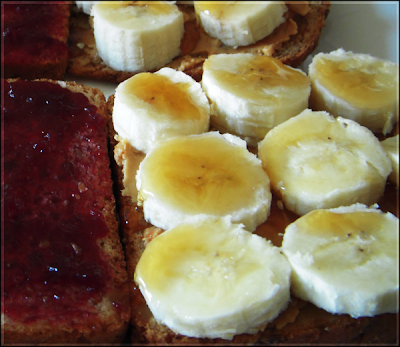 btw i am going to def try the peanut butter jelly banana heaven :) looks yunny! Ok now that is a good variation! The image is worth drooling over. You sure are a good cook. I can easily see that. Even from the way you describe foodstuffs. From that story u posted on the other site, all I can say is that you are one of the best amateur story writers. when u finish the novel, i'll be sure to read it... ! Good that you committed to writing it. It is going to be good stuff - that much I am sure of. Didnt know timekeeper's wife was that good. somehow havent felt like going through it. Have you read Sophie kinsella's latest? cant remember the name but seemed like a reliable read. WIAN - I dont have the guts to post the story on here. Maybe later when I've rubbed the bad taste from my mind and go back and re-write it, I'll dare to do something about it! Yword - Unfortunately, I didnt complete it. Today's the last day!! Oh well, there's always next year, and I'll make sure I'm better prepared next time :) TTW is very subjective, I know a lot of people who hated it, I was immensely moved though- also Ava and Smita have done reviews on their blogs so do read those. Havnt yet got my hands on the new Kinsella, I think Smita is/was reading it.